Well this is basically all I want to eat during the summer. OK, maybe not THIS specifically, but things LIKE this. Big green salads loaded with fun things (like ripe tomatoes and avocados) and topped with some kind of protein. Usually salmon. If salmon is an option, I always get it. Especially when prepared like this: quickly, simply, a little bit crispy, with loads of spicy herbs on top. The recipe below makes two big servings (like if you're just eating this or four smaller ones (like if you're eating other stuff, too). It all comes together quickly, too. 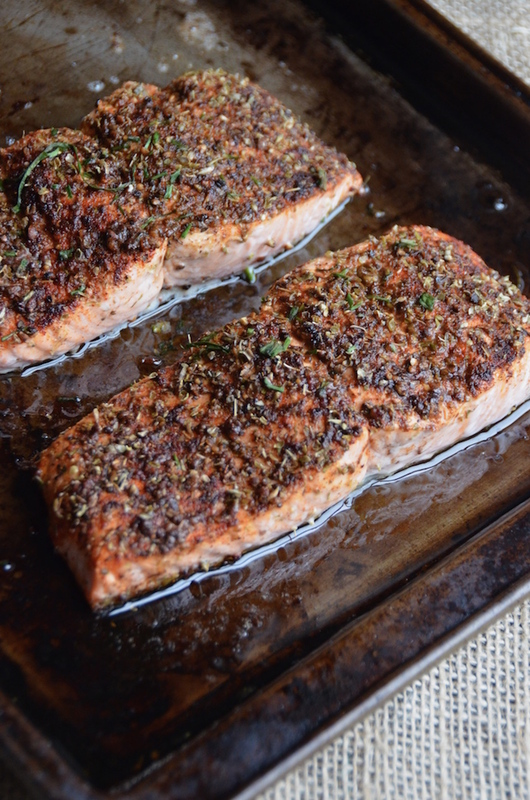 The salmon broils up in the oven while you prepare the rest of the salad. It's simple, it really is. But it tastes like something you'd be happy to pay for at a restaurant. That's my favorite kind of thing. Place salmon fillets on baking sheet and brush with Tabasco and olive oil. In a small bowl, whisk together chili powder, oregano, cayenne, salt, and black pepper. Sprinkle onto salmon fillets and press lightly. Broil 10 minutes, or until cooked through or to desired doneness. Remove from broiler and let cool. 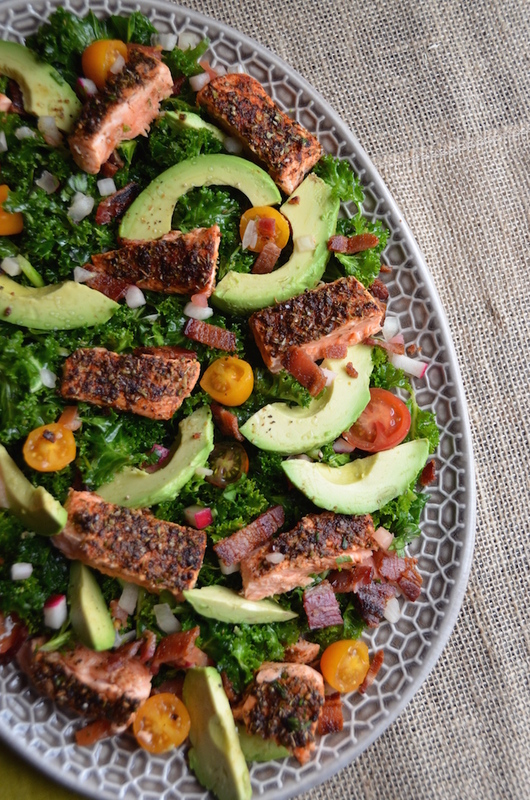 Make the salad: In a large bowl combine chopped kale, lime juice, olive oil, vinegar, salt, and black pepper. Use your hands to massage dressing well into the kale to tenderize it. Add tomatoes and radishes, and toss well. 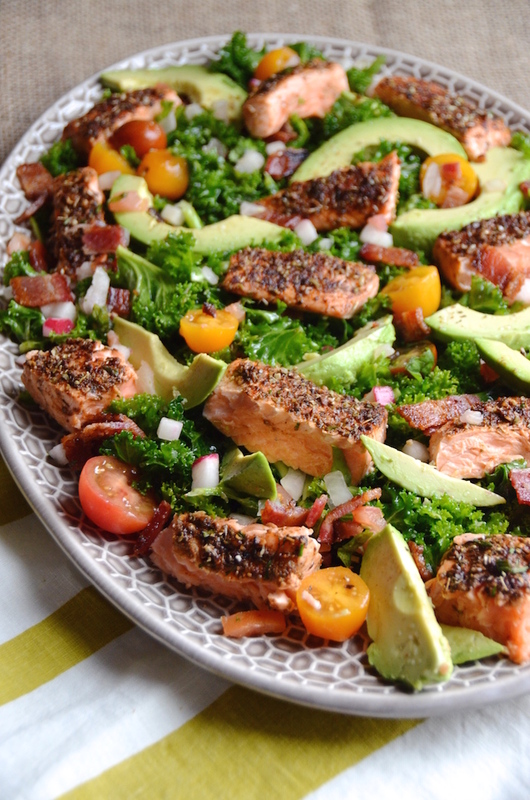 Arrange on a platter, then top with avocado slices, broiled salmon cut into smaller pieces, and chopped bacon, if using.